Melanin Pigment is responsible for giving a dark(black) complexion to your skin. Quantity of melanin in your skin controls your skin complexion. 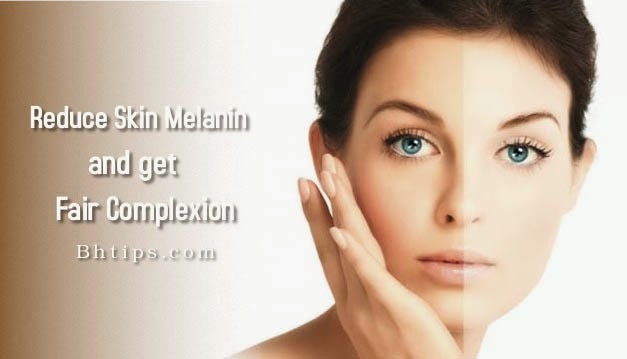 Excessive or over production of melanin pigment results in dark complexion.People with fair skin when start producing more melanin, their skin becomes dark. Vitamin A’s synthetic form, Retin-A is used widely for exfoliating the hyperpigmented dead skin cells and promoting production of new cells. Try to eat foods rich in Vitamin A. Dark green and yellow vegetables and yellow fruits, such as broccoli spinach, turnip greens, carrots, squash, sweet potatoes, pumpkin, cantaloupe, and apricots are good sources of Vitamin A. Milk, butter, cheese, and whole eggs are also good sources of Vitamin A.
Vitamin E cannot reduce melanin production directly, but is effective in reducing the hyperpigmentation caused by overproduction of melanin. Sweet potatoes, mangoes, butter, margarine, eggs, wheat germ oil, yams, spinach, broccoli, corn, avocados, fortified cereals are good sources of Vitamin E.
First of all you need to avoid direct exposure to sun rays which is the main reason for over production of melanin. Try to wear clothes that cover your neck, arms and legs and wear shoes covering your feet while going out in the sun. It is also advisable to wear gloves, hats and sunglasses for protecting the face from UV rays. Before going out don't forget to apply a good sunscreen lotion. Apply a sunscreen that has a sun protection factor (SPF) to all parts of your body that will be exposed to the sun if you are outdoors. This can include your face, ears, neck, hands and other uncovered areas. As you know excessive quantity of Melanin Pigment give your skin dark complexion and its production increase by heating effects but a daily application of this mixture cools your skin, reduces melanin production and brings back your fair skin. To make this skin whitening pack at home you need to follow the given instructions. (i) Take 1-2 tablespoons of Sandalwood and mix with same amount of Rose water to make a fine paste. (ii) Apply this on dark melanin areas. (iii) Let it stay for 10-15 minutes. (iv) Finally rinse off with cool water and pat dry your skin. (v) For best results, repeat this at least twice a week. Almond contain a good amount of essential amino acids, fatty acids and Vitamin E. All of them not only help in skin whitening but also rejuvenate your skin by reducing the appearance of age spots, fine lines and wrinkles. In addition, this paste works wonderfully in fading the appearance of melanin dark spots and helps a lot to get back fair complexion. To make this whitening paste follow the given instruction. (i) Soak 4-5 almonds overnight. (ii) In the morning remove their skin and grind them fine. (iii) Make a paste by adding one teaspoon of milk. (iv) Apply this paste on melanin dark spots. (v) After 15 minutes wash this with fresh water. A skin whitening pack made from oatmeal, curd and tomato juice helps to remove the sun tan and lightens the melanin spots. You can prepare this pack according to given instructions. Mix 1 tablespoon of oatmeal with 1 tablespoon of curd and 1 teaspoon of tomato juice. Apply this on your clean face. Keep it on for 20 minutes. Then wash it off with cold water. For best results repeat this at least twice per week. A fine paste made from honey and sour cream not only helps in getting rid of dark melanin spots but also deeply moisturize skin and prevent the appearance of age spots. You can make this pack by following given instructions. Take 1 tablespoon of honey and 2 tablespoons of sour cream. Apply this mixture to your face and allow it to sit for at least 15-20 minutes. Clean it with soft and moist cloth and finally wash off with fresh water. Mint is also very helpful in reducing the appearance of melanin dark spots. To get rid of melanin dark spots you can make a mint paste at home according to given instruction. Grind a few mint leaves and mix them with some water to form a thick paste. Apply the paste to the melanin spots on your skin. Leave it on for 15 minutes and then rinse it off to help reduce dark pigmentation. Sometimes excessive production of melanin may be a sign of an other medical condition. Therefore, first of all you must consult your problem with a Medical Doctor or Dermatologist and diagnose the exact cause for excessive production of melanin. If the excessive production of melanin is not caused by any disease or hormonal imbalance and the exact cause is "Over exposure to UV Sun rays" then to reduce Melanin production, according to your skin type, you can go with any of above remedies, that really works for your skin.